Have you ever wondered WTF is SEO? Well, although I’m not here to explain to you what it is, the least I can do is tell you what it stands for and how to improve it with your Facebook page. SEO stands for Search Engine Optimization and by improving it, you make it easier for people to find your stuff. 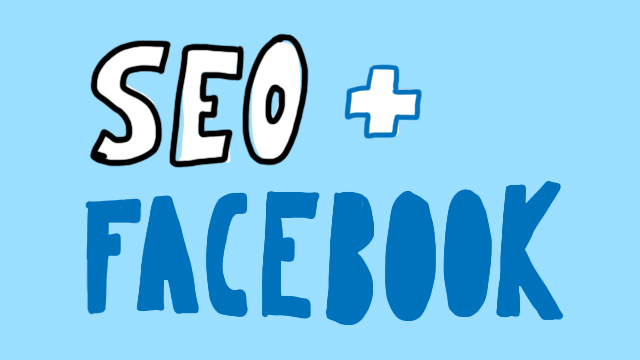 Optimizing your Facebook Business Page is more important than you think. Ideally, all the social profiles of your brand should appear on the first page of the results and for that, you might need to review a couple of things on your Facebook page that will help you to achieve that. It won’t hurt, I promise. (I can hear you going: duh… obv!) This step is extremely important. 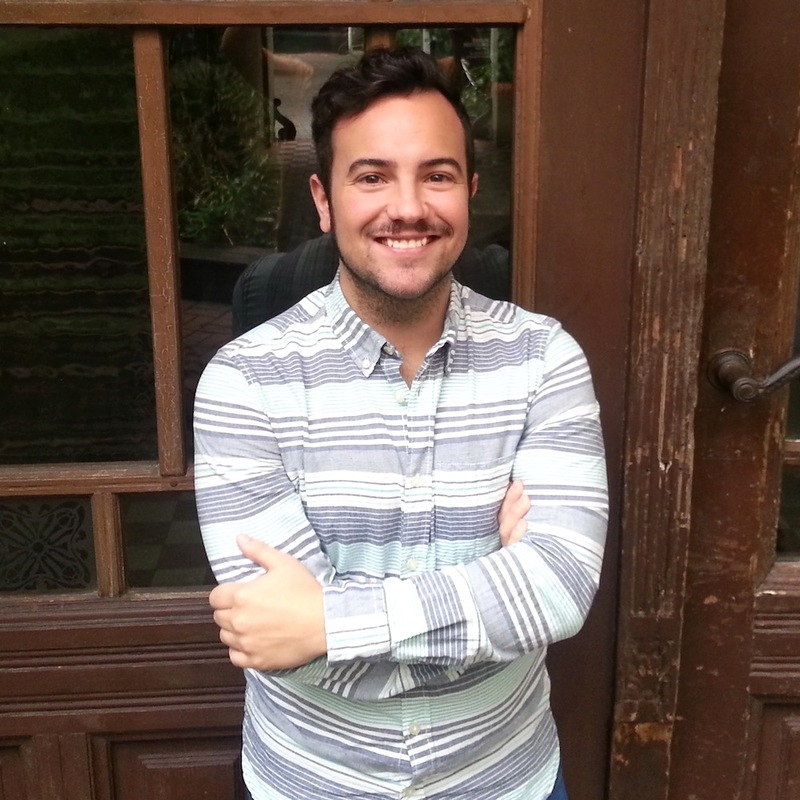 Your Facebook Business Page must have the right name – that means to match your brand’s name. It is important because the name will appear in the search results as meta title, giving the proper information to Google. It will also help people to easily find you on Facebook. Choose carefully and think twice before changing it: once you do it, it is permanent. To some extent, you are able to change it again but it is not easy. I had to do it once at my previous job but it requires to have an account manager on Facebook and a lot of papers to demonstrate that the brand went through a rename or rebrand process. I think that the more fans the page has, the harder is to make those changes. Maybe it seems stupid to include this step here but it doesn’t hurt to include it as I believe not everybody may know that this is actually possible. YES! You can customize your Facebook Page URL and since you have the opportunity, I think you should use your brand name for it (makes sense, right 🙂 ) Ideally, page title or name and vanity URL will match. If unfortunately you are not able to create the vanity URL with your brand name (because is taken, is too long or other reasons) then go for a shorter and yet memorable version, of course, on brand. This will make your chances to appear in the search results much higher and will strengthen your brand identity. In order to show the relevance of this step, I will give you an example. 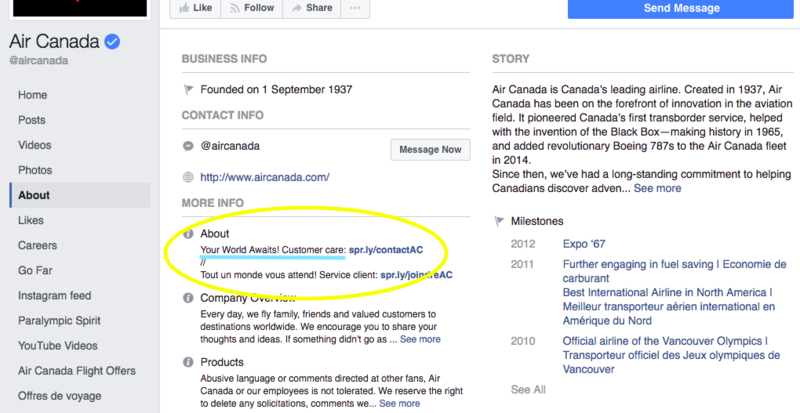 I have googled “Air Canada Facebook”. This is not random at all as many people prefer to see what others say about a product before buying. Being “others” the entire social media audience. As you can see, there is a little text that Google grabbed from the Facebook page. That text comes from their ABOUT section, on their Facebook Page. So there are approximately 95 characters that you should fill out properly, cause that is what people will see. So be keen and create a proper introduction of yourself, including one or two keywords relevant to your brand or service. Be natural and don’t fill this information with keywords just because you just discovered it indexes. Google always reward natural language. Use this section strategically. Again, making this right will not only help people that google you but also people that are already on Facebook. Go ahead and complete this section as much as you can with your address, telephone and opening hours if relevant. A complete profile shows that you care and you are professional. Who is looking for information about you will highly appreciate this. And that’s all! Easy peasy. I hope you find it helpful. Previous PostWhat have most popular tweets in common?